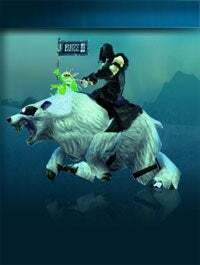 BlizzCon sold out in record time, with additional tickets sold via a lottery that occurred while I was in Germany for the Games Convention, so while there might not be a BlizzCon for me, there can still be a special edition BlizzCon murloc-riding polar bear mount! DIRECTV has announced that everyone who tunes in to the BlizzCon pay per view coverage from BlizzCon on October 9th and 10th will be receiving the limited-edition mount, which is one of the main reasons so many people wanted to go in the first place. New customers who sign up for DIRECTV between now and September 30th will get both the PPV event and mount for free, while existing subscribers will have to shell out $39.95 for the privilege. But what if you don't have DIRECTV and have no desire to change? Odds are you have a friend or relative who does. Give them $40. Get your polar bear mount on. Oh, and before we start complaining because we didn't think of it first, the odds are the mount will be delivered via redeemable code in game, so even if you don't care, eBay always cares.DIRECTV Delivers Unprecedented Event Access to Sold-Out BlizzCon™ 2008 DIRECTV's Live BlizzCon 2008 Pay Per View Event Is Free To Customers Who Sign Up for DIRECTV by Sept. 30 BlizzCon(TM) 2008 EL SEGUNDO, Calif.—(BUSINESS WIRE)—BlizzCon™ 2008, Blizzard Entertainment®'s sold-out gaming convention celebrating the global player communities that surround its Warcraft®, Diablo®, and StarCraft® game universes, will be televised live in HD on Oct. 10 and 11 as a pay per view package available exclusively to DIRECTV customers nationwide. DIRECTV is currently running a special promotion — available through the BlizzCon website (http://www.blizzcon.com/dtv) – offering the pay per view event free to new customers who sign up for DIRECTV by Sept. 30, 2008. Current DIRECTV customers will be able to order the event beginning Sept. 28 for $39.95. In addition, DIRECTV customers who purchase the pay per view event or get it as part of the special promotion will also receive an exclusive in-game polar bear mount, complete with a BlizzCon-flag-waving murloc, for the World of Warcraft character they play. "This first-ever BlizzCon pay per view event is an exciting option for Blizzard gamers across the country," said Steven Roberts, senior vice president, New Media and Business Development, DIRECTV, Inc. "For the first time, they don't have to rely on the Internet to get the inside scoop on the convention. Viewers will feel like they are actually walking the show floor as they watch live coverage of the event from DIRECTV in HD. We are happy to be partnering with Blizzard Entertainment and to televise one of the most highly anticipated gaming conventions of the year exclusively to DIRECTV customers nationwide." This DIRECTV-produced pay per view event will deliver more than 16 hours of live HD coverage from the show floor spanning both days of the convention, including exclusive interviews, demonstrations and more. The live coverage, broadcast from the Anaheim Convention Center in Anaheim, Calif., will air Oct. 10 and 11 on DIRECTV channels 97 (HD) and 120 (SD). For more information on how to order the DIRECTV BlizzCon 2008 pay-per-view event please visit www.blizzcon.com or call 1-800-728-9375.